We’d love your help. Let us know what’s wrong with this preview of Signs In The Rearview Mirror by Kelly Smith. To ask other readers questions about Signs In The Rearview Mirror, please sign up. 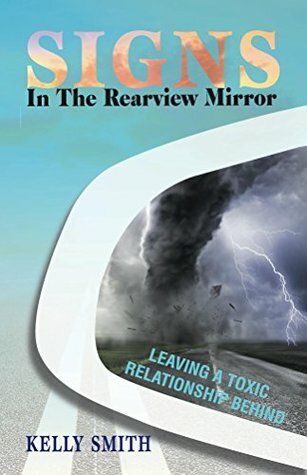 Signs in the Rearview Mirror: Leaving A Toxic Relationship Behind is a powerfully honest and emotional look into an abusive relationship and breaking free. Dating someone is always a scary yet exciting time. We can only go on first impressions as we get to know each other. But what happens when things change. The person who you thought you knew turned out to be abusive. It's easy for people to judge but until you have been in that situation, I don't think it's easy to say. Well this is exactly what happened to Kelly. She knew Gabe from school. So when they make contact with each other via social media, Kelly never imagined that their seemingly perfect relationship would become Toxic and abusive. Gabe is manipulative, controlling, and mentally abuses Kelly. You ask why doesn't she just walk away? Well what this book does is explain just that...! I felt alot of compassion towards Kelly, she hasn't had the easiest of starts. We all long for happiness and love, no one wants to face the world alone. But watching her gain her strength and courage to break free was uplifting and powerful. Signs in the Rearview Mirror is a thought provoking, raw and poignant read. It's a powerful story of hope and courage. Delving into the cycle of abuse women and men can find themselves in and the journey and strength to break free. I applaud Author Kelly Smith for being so raw and open and laying her emotions out there. This book will definitely help people to understand more about abusive relationships, but also people will be able to relate to Kelly's story. I urge you to read this powerful book. This is a book for anyone who has weathered the storm of a toxic relationship or even if you haven’t it’s a decent insight into what happens and how the victim slides into various forms of self abuse in the hope of becoming somebody else to please the abuser. Kelly has opened up and laid her life bare in Signs in the Rearview Mirror she is now your average American but at the start of the book she is in a relationship which leads to a pregnancy at age seventeen. For both of them it wasn’t the way This is a book for anyone who has weathered the storm of a toxic relationship or even if you haven’t it’s a decent insight into what happens and how the victim slides into various forms of self abuse in the hope of becoming somebody else to please the abuser. Kelly has opened up and laid her life bare in Signs in the Rearview Mirror she is now your average American but at the start of the book she is in a relationship which leads to a pregnancy at age seventeen. For both of them it wasn’t the way life was planned. Even though her and Derek stuck together for a lengthy time trying to make the family unit work it never seemed enough for her. So when she opened up her facebook one day and found an ex-school crush she was hesitant about sending a friend request … that reminds me of a song, anyway I digress. With hindsight she should have logged off and forgotten Gabe existed but no they re-connect and therein all her problems begin. The remainder of the book is a recount of what happens, she is upset when her and hubby file for divorce yet also lusts after Gabe. It seems to me the regret of losing the safety net of her marriage has left her vulnerable, so even when it becomes abundantly clear what Gabe is like she doesn’t have the strength to kick him to the kerb because she is afraid of being alone. Face it she has gone from her parents’ who had their own issues which reflect on her, straight into marriage and parenthood at a young age .. then onto Gabe. She hasn’t had an opportunity to be herself or let herself grow. I read the book and felt sorry for her at times but also wondered why she tolerated some of Gabe’s actions. It’s easy to say ‘leave’ I am well aware of that and the fact she was facing depression made it harder but even so I and I’m sure herself wish she could have found the courage earlier. Signs in the Rearview Mirror is a tale that shows the real anguish of the author, a truthful account of her life of abuse which must have been quite hard to share, at times emotional but also by the end shows signs of bravery coming through. It could well help people going through that very cycle right now and give them confidence that it is ok to break free .. you don’t have to be a victim for life. This book is a page-turner for sure. I am so proud of the author for putting her experiences of a toxic relationship in a book for others to have hope. This book is an important read for many, it has the power to create change. I always find it courageous of an author to put their story out there and Kelly has done just that. Its not an easy read at times but it is a fast paced book that leads you on from one incident to another. I felt that I was reading the book as it was spilling out of Kelly’s mind and onto the pages at times, skipping into what was yet to come when we were at the early stages of the relationship. This made it an interestin This book is an important read for many, it has the power to create change. I always find it courageous of an author to put their story out there and Kelly has done just that. Its not an easy read at times but it is a fast paced book that leads you on from one incident to another. I felt that I was reading the book as it was spilling out of Kelly’s mind and onto the pages at times, skipping into what was yet to come when we were at the early stages of the relationship. This made it an interesting read as I wanted to know how it got to those future points of time. Sign’s In The Rearview Mirror is honest, thought provoking and on a subject that shouldn’t be ignored. Toxic relationships are often talked about but looking at what makes them toxic is the other side and one that isn’t covered enough. Thank you Kelly for bringing light to a dark situation and for letting readers know there is a way out, despite the difficulty. This is the story of Kelly Smith. It’s an autobiographical account of her experiences in an abusive relationship, but it is also in a way an attempt to apologise for her own failings in her relationships. It is incredibly hard to admit to your own mistakes or wrong paths taken in your life. Smith does so to a certain extent, but there is either an attempt to shield or a refusal to dive too deeply. I can understand both of those reasons. It’s hard enough to share your mistakes with the world witho This is the story of Kelly Smith. It’s an autobiographical account of her experiences in an abusive relationship, but it is also in a way an attempt to apologise for her own failings in her relationships. It is incredibly hard to admit to your own mistakes or wrong paths taken in your life. Smith does so to a certain extent, but there is either an attempt to shield or a refusal to dive too deeply. I can understand both of those reasons. It’s hard enough to share your mistakes with the world without opening up your soul, so complete strangers can have a good look around. Shame, blame and guilt walk hand in hand with fear, anger and a sense of powerlessness when you end up in an abusive relationship, especially when you involve children in such a dangerous situation. You can’t take back the impressions, the experiences or indeed the impact of experiencing or being around abuse has on a young mind. It’s important to note, and the author does at the very beginning of this book, that this is the story from her perspective. Her children will have a completely different view on her choices and why she chose Gabe over her safety and their safety over and over again. Abusive relationships are hard for outsiders to understand. There are a lot of misconceptions about why the abused stays and also the level of support there is depending on where you live. I think it is very important to note that the author acknowledges, albeit in a less focused way, her own abusive behaviour towards her first husband. The way she treats the people she loves/loved is through her own frame of references. Her own references were determined by the volatile and loveless relationship with her own mother, and her father the alcoholic. On a side note it’s interesting that Smith holds fonder memories of the abusive drunk, and is more antagonistic towards the mother who lived with the abusive drunk. Has she inadvertently reproduced a scenario where she gives her children reason to dislike her choices, her narcissistic tendencies and indeed is herself the volatile verbally abusive person she saw in her own mother. The author talks a lot about the how and why of ending up in a relationship with Gabe has been steered by her own sense of insecurity and lack of self-worth. For me this is closure. The end of this chapter in her life, and in a way the written word may make it more real and definitive for her. Kudos to the author for finally extracting herself from an abusive and damaging relationship, and for trying to comprehend the damage it caused. The most important thing is acknowledging and then being strong enough to cut the ties that bind. I think it is commendable to try and break the cycle. To try and change the habits of a lifetime and to try and move forward. None of it is a guarantee that your loved ones will forgive or forget, but perhaps everyone can find a way forward. The author needed to see the cycle to be able to break out of it and I hope she continues to search and grow from her epiphanies. It’s an honest read, albeit a hard one at times. This book broaches the subject of toxic partnerships, and does so successfully. This is a true account of a relationship the author, Kelly Smith was part of. She wrote the book to share her experiences with others so that they might recognise the signs of an unhealthy pairing. Kelly discusses frankly the decline of the relationship, and why she made the decisions she did. It can be hard for outsiders to understand why someone would stay with a partner like Gabe. They say ‘oh just leave’, it re This book broaches the subject of toxic partnerships, and does so successfully. This is a true account of a relationship the author, Kelly Smith was part of. She wrote the book to share her experiences with others so that they might recognise the signs of an unhealthy pairing. Kelly discusses frankly the decline of the relationship, and why she made the decisions she did. It can be hard for outsiders to understand why someone would stay with a partner like Gabe. They say ‘oh just leave’, it really isn’t that easy, as Kelly shows in the book. People like Gabe are good manipulators, the warning signs are easily missed, and once their true colours are revealed, its hard to just leave. Kelly describes how a competent mother of three, spirals within a destructive relationship, losing her confidence and self esteem. This isn’t an easy read but I highly recommend it, if you recognise any of the traits Gabe has, take a step back and ask yourself. Am I in a healthy relationship? Is this good for me? Well done to Kelly for having the resolve to pen such a personal account. This book may contain triggers for some readers. Signs In The Rear View Mirror is written with courage, strength and honesty. Kelly's story is one people the world over are experiencing and more often than not in silence. *Domestic abuse effects 1 in 4 women and 1 in 6 men. On average 2 women are being murdered a week and 30 men per year due to Domestic violence.We need more people like Kelly to tell their story, to make people living in fear aware they are not alone and to give them the courage to do something about it.Kelly's story is brutall Signs In The Rear View Mirror is written with courage, strength and honesty. Kelly's story is one people the world over are experiencing and more often than not in silence. *Domestic abuse effects 1 in 4 women and 1 in 6 men. On average 2 women are being murdered a week and 30 men per year due to Domestic violence. We need more people like Kelly to tell their story, to make people living in fear aware they are not alone and to give them the courage to do something about it. Kelly's story is brutally honest and shows how someone can be living within an abusive relationship that they just can't simply walk away from. It shows how a relationship like this has a knock on effect not only to the person in the relationship but also their children. Kelly lived through the most horrendous few years but her story shows she is a true survivor and gives hope to anyone else in the same situation.